This set of Molecular Biology Quiz focuses on “DNA Polymerase Elongates DNA Strands, Complete Replication Form Complex”. 1. With respect to DNA polymerase holoenzyme pick the odd one out. Explanation: The sliding clamp loader or the γ complex are five protein subunit protein complexes whose activity is controlled by ATP binding and hydrolysis. To catalyze the sliding clamp opening, clamp loader must be bound to ATP. Once bound to ATP the clamp loader binds to the clamp and opens the ring at one of the sub unit interface. The resulting complex now binds to DNA. 2. A complete DNA polymerase III holoenzyme contains ____________sub units. Explanation: The complete DNA polymerase III holoenzyme contains 6 subunits. They are two copies of DNA polymerase III core proteins, one sliding clamp connected to a clamp loader. This clamp loader is further connected to the two DNA polymerase III core proteins by a pair of τ proteins. 3. How many polymerases are present in a replication fork? Explanation: Three different polymerases are present in a replication fork. They are DNA polymerase α or primase, DNA polymerase δ and DNA polymerase ε. The DNA polymerase α or primase initiate new strand synthesis and DNA polymerase δ and DNA polymerase ε extend these strands. 4. With respect to eukaryotic replication which of the following enzyme is not correctly paired with its function? Explanation: In case of prokaryotic replication the clamp loader complex is responsible for the recruitment, maintenance and coordination of DNA polymerases. But its analog, the RF-C complex found in the eukaryotes does not perform this function. 5. The formation of the phosphodiester bond is an example of_________reaction. Explanation: The phosphodiester bond is formed in an SN2 reaction in which the hydroxyl group at the 3’ end of the primer strand attacks the α-phosphoryl group of the incoming nucleoside triphosphate. The leaving group for the reaction is pyrophosphate, which arises from the release of the β- and γ-phosphates of the nucleotide substrate. 6. DNA synthesis is known as a coupled process. Explanation: The addition of a nucleotide to a growing polynucleotide chain of length n is indicated by the reaction: NTP + (NMP)n → (NMP)n+1 + P – P.
But the free energy for this reaction is rather small. Additional free energy is provided by the rapid hydrolysis of the pyrophosphates into two phosphate groups (P – P → 2Pi). The net result of nucleotide and pyrophosphate hydrolysis is the breaking of two high – energy phosphate bonds. Therefore, the DNA synthesis is known as a coupled process. Explanation: The DNA helicase travels along the lagging strand template in 5’→3’ direction in the replication fork. The DNA primer associates with this DNA helicase to synthesize new primers on the lagging strand template. 8. DNA polymerase III holoenzyme does not need to interact with the helicase during replication. Explanation: The DNA polymerase III holoenzyme interacts with the DNA helicase through the τ subunit, which also binds to the DNA polymerases. One of these polymerases replicates the leading strand and the other replicates the lagging strand. 9. Binding of polymerase III and helicase ensures helicase efficiency. Explanation: The association of helicase with polymerase III stimulates the activity of the helicase by increasing the rate of its movement tenfold. Thus the DNA helix slows down if it is separated from the polymerase III. This binding also controls and coordinates the function of both the helicase and the DNA polymerase holoenzyme. Explanation: Association of primase with DNA template is brought about by the interaction of primase with the helicase and SSB protein. Although this interaction is relatively weak, it strongly stimulates primase function. 11. How is the strength of interaction between primase and helicase which regulates the length of Okazaki fragments? Explanation: The relatively weak interaction between the primase and DNA helicase is important for regulating the length of the Okazaki fragments. A tighter association would ensure more frequent primer synthesis on the lagging strand and, therefore, shorter Okazaki fragments. Similarly, a weaker interaction would result in longer Okazaki fragments. 12. Which of the following enzyme is not required for the synthesis of lagging strand? iv) Gyrase – releases stress by removing supercoils within the DNA helix. Thus gyrase does not take part in the synthesis of lagging strand. 13. Length of Okazaki fragments in eukaryotes ranges between ____________ nucleotides. Explanation: The length of Okazaki fragment varies in between 100 – 400 nucleotides in eukaryotes. The length of Okazaki fragments in bacteria is about 1000 – 2000 nucleotides. They are the transient intermediates in lagging strand DNA replication. 14. Polymerization of dNTP by DNA polymerase is in 3’ → 5’ direction. Explanation: DNA polymerase needs a free 3’ – OH to polymerize dNTPs. This free 3’ – OH end is provided only when the DNA strand is elongated in 5’ → 3’ direction. Thus, polymerization of dNTP by DNA polymerase is in 5’ → 3’ direction. 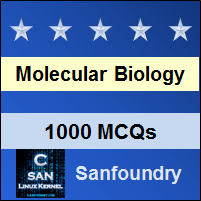 To practice all areas of Molecular Biology for Quizzes, here is complete set of 1000+ Multiple Choice Questions and Answers.